Reed Switches may need to be mounted suitably on various different types of PCBs, both SMT and on through hole types, and at times, even in custom plastic housings that need to be encapsulated. This requirement means that reed switch leads should be modified suitably. The leads may need to be cropped for PCBs with slots, or SMD formed or goal-post formed, or ever cropped, welded with longer leads, or soldered with longer cables, to meet these mounting requirements. Cropping or forming the leads of a reed switch removes low reluctance Iron and introduces high reluctance air into the magnetic circuit, much the same as adding resistance to an electrical circuit. The result is that a greater number of equivalent Operate AT is required to actuate a reed switch with cropped or formed leads. Since the Operate AT is altered, it is evident that this increases the release AT as well. This would mean that the actuating distance will decrease. More information and videos on this phenomenon can be found on our Reed Switch FAQ page. When forming the leads of reed switches and reed sensors, this usually requires cropping, bending and probably flattening if required. These collective operations require a lot more force to be thrust on the leads than simple cropping of leads. Extreme caution should be taken to ensure that shock is not transferred to the delicate glass to metal seals, as this could damage the hermetic integrity and cause the reed blade gap to change. Many of the same rules that pertain to cropping also apply to forming. Stops or guides that use the end of the seal as a reference point for forming can damage the hermetic seals and this is why it is better for the Reed Switch manufacturer to crop or form leads. Using the seal as a dimensional reference point invariably results in variation of the lead dimensions after forming. The recommended practice is to use the lead ends as a reference, providing clamping between the seal and the forming point. A clamping device protects the seals from the stress that comes from formation. This approach also allows for normal variations in glass length and distance between seal and each lead end. When requesting for reed switches with cropped or formed leads, it is important to note some points regarding dimensions and tolerances. Illustrated are two methods for dimensioning the same goal-post modification. The first one presents an impossible situation mainly because the glass length and its position relative to the gap vary greatly between reed switches. Compared to the precise dimensions of the reeds, it is not advisable to use the sealed glass length as a reference point. It is also better to now stack three dimensions to come up with an overall length, as this would not be achievable. The better way to assign dimensions and tolerances to a cropped or formed reed second is explained here. 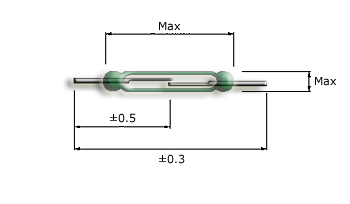 The figure on the left has all the necessary dimensions referenced either from the air gap or the reed, both of which can be held with close tolerances. The bends are set up equally from the magnetic center of the reed switch, which is located at the air gap, where the blades overlap. When a magnet is used for actuation, the operating point for reed switches with the same Operate AT will be uniform. Requesting for a formed reed switch with such dimensions can have leads cut and formed in one operation, and the number of measurements required to inspect the modified switch is minimized. As PCBs and mounting spaces are getting smaller and smaller, it is important that reed switch also shrink in size and have the lead formation tolerances tight to ensure requirements in mounting are met. This is especially true when assembling large volumes of reed reed switches or reed sensors. We have listed examples of tolerances that can be met for various types of lead formations. The best method is for the reed switch manufacturer to use specially designed cropping tools where the leads are gripped just outside the glass seals to prevent shock from transferring to the contacts, and the unwanted leads cropped in one swift motion. It is also recommended that clamping of the leads be done by giving a gap from the seals, approximately equal to the glass diameter as this ensures there is less scattering of the AT band after cropping. It is also recommended that such tools only crop only lead at a time to reduce the impact forces of the cropping operation. Tolerances that can be achieved for cropped reed switches are shown on the left. SMD and other complex lead formations are always best done by the reed switch manufacturer. The special tools used ensure that the leads are gripped just outside the glass seals, cropped to the required length, and then SMD formed, in one swift motion. It is always better to select reed switches with manufactured flat leads as no extra flattening is required during SMD formation. Any extra flattening done will most certainly add more shock the products, resulting in AT band scattering. When reed switches with pre-flattened leads are used, the SMD formed reed switches have oriented internal blades for maximum in-group sensitivity. Goal-post formation is required when PCBs use plated through holes for soldering. Special goal-post forming tools ensure that the leads are gripped just outside the glass seals, cropped to the required length, and then formed into a kind of football goal-post, in one swift motion. As is generally the norm, it is always better to select reed switches with manufactured flat leads. This ensures that the blades are oriented to the PCB and collective sensitivity of a batch of goal-post formed reed switches, but this is true only when using magnets where both poles are parallel to the length of the reed switch glass. When a goal-post formed reed switch is being actuated with a magnet, oriented with only one pole towards the reed switch, it does not matter if the blades are not oriented parallel to the goal-post formation. When reed switches need to be used on PCBs with plated through holes, but vertically, some extra operations are required. The reed switches need to be L-formed first, and then welded with a wire to help with vertical mounting. The same care that is required for goal-post formation of reed switches is taken for L-formation. After this process, cropped wire which is not ferro-magnetic is welded to the L-formed reed switch. Special care is to be taken during welding and more information is available here.